Had an astonishing, gobsmacking, all-time record number of blog hits at the weekend from my post about the London arms fair Life Neutral hoax. The number of views on Friday was a record for me – nearly FOUR TIMES higher than the previous most-hit-making post in my relatively short blogging career. My hits were already getting close to the previous record by 5pm, when I wandered up the health club to get the latest gossip from the Boys in the Steam Room. The Boys were in earnest discussions about veruccas, hip replacements, The Dirty State of the Steam Room Walls, and How To Rehabilitate Prisoners, so I didn’t stay long before returning home to more absorbing subjects. When I got in the hits had gone way, way, over the previous record, and every time I checked back throughout the evening the number was still rising. Saturday saw 2.7 times my previous record number of hits and yesterday got me 1.4 times the previous record – almost all views of that one blog post. Interest was boosted by retweets – notably by the hoax organisers, www.spacehijackers.org , and by www.stopthearmsfair.co.uk. I had about 300 hits from Facebook alone, after someone posted a link to my blog there. There were also links through from other blogs and, bizarrely, from a cycling forum whose members had taken an interest in the arms fair. My hit-rate was partly due to timing – I happened to be mooching about watching Twitter when the hoaxers were being “outed” on the BBC. Until then, a lot of people had taken as a sick reality the spoof, claiming that arms manufacturers wanted to “offset” the deaths they caused in the developing world by funding Western parents to have more children. I listened to the BBC World Service interview, during which Space Hijackers ‘fessed up to it all being a big hoax, and quickly banged out a blog post on the subj. But more than sheer timeliness, the number of hits, I think, reflects the growing unease about the way our country happily sells weapons of mass destruction to certain countries and in the next breath accuses other countries of attacking their own people. There is a particular, and peculiar, contrast between Libya (where we are backing the overthrow of a government to which we sold weapons until recently); and Bahrain, which is openly attacking its own people, yet to which we were selling weapons at last week’s arms fair. It seems we really don’t care whom we furnish with murderous weapons, as long as there’s a profit to be made. There are too many commercial interests involved for the mainstream media to openly criticise our country’s warmongering, so people are turning to the internet to get the information they want about the steadily-growing peace movement. 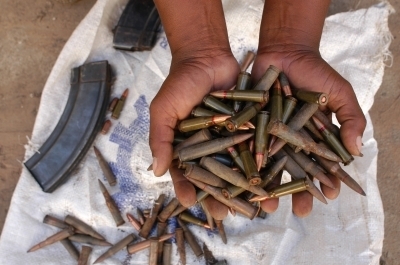 A minority continue to believe that the arms trade is necessary for our economy. As many have more sensibly pointed out in response to this specious argument, “they said that about the slave trade”. Our economy survived the cessation of slavery; why shouldn’t it survive the end of the trade in mustard gas, leg irons, restraint equipment, white phosphorus, and bullets and bombs without end?